Upper Columbia sockeye might be getting all the play on Northwest Sportsman’s Web sites these days, but it’s their landlocked brethren that are among the fishing highlights around Washington right now. Fishing for kokanee at Rimrock Lake west of Yakima is said to be “about as good as it gets these days,” according to two WDFW employees. “You can catch your daily limit of 16 fish in just a few hours of fishing,” says Southcentral Washington regional habitat program manager Perry Harvester. But that’s not all that’s to be had these days in the Cascades. Mountain troutin’ is firing up throughout the range while steelheading’s been pretty good on the Columbia system, Chinook and coho are biting on the Coast and Northern Puget Sound. And up next on the angling calendar: Buoy 10. It opens Aug. 1, and we hit it and hit it hard in our August issue, heading to newsstands around the Northwest right now. In the meanwhile, here’s more from the Weekender. Anglers are reeling in chinook and coho in Puget Sound, where crabbing is still an option and two additional marine areas open for salmon Aug. 1. Meanwhile, anglers are having some success at Baker Lake, which recently opened for sockeye salmon. For the first time, anglers are fishing for sockeye salmon in Baker Lake, where the fish are returning in significantly higher numbers this year. Anglers fishing Baker Lake can retain up to two adult sockeye salmon that exceed 18 inches in length from Baker Dam upstream to the mouth of the Baker River. All other salmon must be released, and no fishing is allowed between the dam and the log boom at the lower end of the lake. The sockeye salmon fishery at Baker Lake is open until further notice, said Barkdull, who reminds anglers to check for any rule changes at WDFW’s website at http://wdfw.wa.gov/fishing/regulations . Separate sockeye salmon fisheries on portions of the Skagit and Baker rivers run through July 31. Elsewhere, anglers can still find some steelhead along the Reiter Ponds section of the Skykomish River. But most freshwater anglers are gearing up for Sept. 1, when the Stllaguamish, Snohomish, Skykomish and portions of the Skagit, Snoqualmie and Green (Duwamish) rivers open for salmon fishing. Beginning Aug. 16, Lake Sammamish will also be an option for freshwater salmon anglers, who will have a daily limit of four salmon, and can retain up to two chinook . All sockeye must be released, and fishing is closed within 100 yards of the mouth of Issaquah Creek. 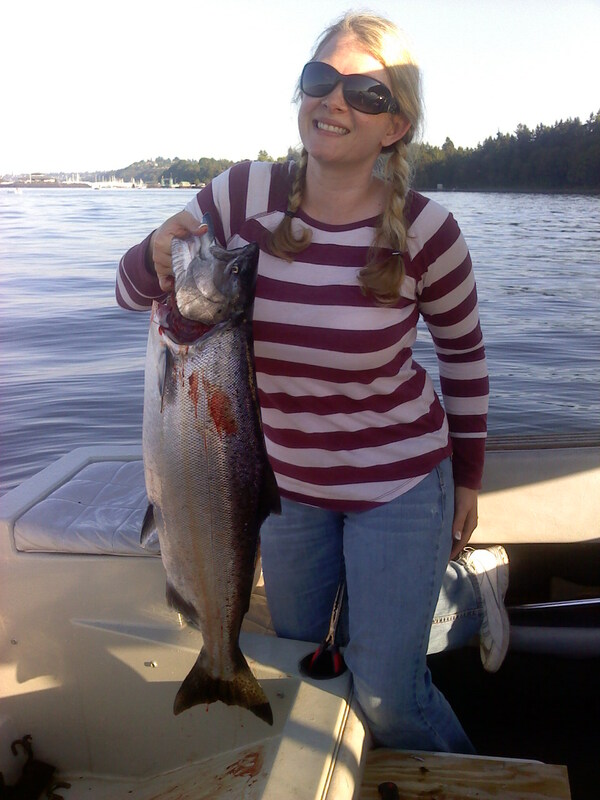 On Puget Sound, anglers can fish for salmon in marine areas 7 (San Juan Islands), 9 (Admiralty Inlet) and 10 (Seattle/Bremerton). Those fishing Marine Area 7 can keep one chinook as part of their two-salmon daily limit, but must release wild coho and chum starting Aug. 1. Anglers fishing marine areas 9 and 10 can keep hatchery chinook – marked with a clipped adipose fin – as part of a two-salmon daily limit, but must release wild chinook. Those fishing Marine Area 9 also must release chum salmon, while anglers in Marine Area 10 are required to release chum beginning Aug. 1. The chinook selective fisheries in marine areas 9 and 10 run through Aug. 31. Beginning Sept. 1, anglers in those two marine areas will be required to release all chinook and chum. Anglers are reminded that regulations vary for inner Elliott Bay, Sinclair Inlet and public fishing piers in those marine areas. August brings other opportunities in the region to catch and keep salmon. Beginning Aug. 1, marine areas 8-1 (Deception Pass, Hope Island and Skagit Bay) and 8-2 (Port Susan and Port Gardner) open for salmon. Anglers fishing those two areas will have a daily limit of two salmon but must release chinook. * Marine areas 4 (east of the Bonilla-Tatoosh line), 5 (Sekiu) and 13 (South Puget Sound) are open through Jan. 2, seven days a week. * Marine areas 6 (eastern Strait of Juan de Fuca), 8-1, 8-2, 9, 10, 11 (Tacoma/Vashon) and 12 (Hood Canal) are open Wednesday through Saturday through Sept. 6, and open the entire Labor Day weekend. * Marine areas 7 South and East are open through Sept. 30, Wednesday through Saturday, and the entire Labor Day weekend. * Marine Area 7 North will open Aug. 11 on a Wednesday-through-Saturday schedule through Sept. 30, and open the entire Labor Day weekend. Summer salmon fishing is in full swing along the coast, where anglers are hooking some bright chinook and nice-size coho. Anglers fishing marine areas 1 (Ilwaco), 2 (Westport-Ocean Shores), 3 (LaPush) and 4 (Neah Bay) can keep up to two chinook as part of their two-salmon daily limit, but must release any chinook measuring less than 24 inches and hatchery coho less than 16 inches. Wild coho must be released unharmed. All four ocean marine areas are open to salmon fishing seven days a week. Salmon fishing is scheduled to continue through Sept. 18 in marine areas 3 and 4, through Sept. 19 in Marine Area 2 and through Sept. 30 in Marine Area 1. However, salmon fisheries in those areas could close early if catch quotas are reached. Milward reminds anglers to check for any rule changes at WDFW’s website at http://wdfw.wa.gov/fishing/regulations . So far this year, angler effort has been lower than expected likely because of rough weather, Milward said. “Conditions should improve as we move into August, making it easier for anglers to get out on the water,” he said. In the Strait of Juan de Fuca, anglers are still having some success hooking chinook and the occasional coho in marine areas 5 (Sekiu) and 6 (eastern Strait of Juan de Fuca), while salmon fisheries in marine areas 11 (Tacoma/Vashon), 12 (Hood Canal) and 13 (South Puget Sound) continue to be slow. * Marine areas 4 (east of the Bonilla-Tatoosh line), 5 (Sekiu) and 13 are open through Jan. 2, seven days a week. * Marine areas 6, 8-1, 8-2, 9, 10, 11 and 12 are open Wednesday through Saturday through Sept. 6, and open the entire Labor Day weekend. Meanwhile, WDFW enforcement officers will be increasing resource-protection patrols on the Skokomish River , where recreational salmon fishing opens Aug. 1 under several new regulations. The daily bag limit has been increased this year from one to two salmon for anglers fishing from the mouth of the river to the Highway 101 Bridge through Sept. 30. However, a new rule in effect this year requires anglers to carefully release any wild chinook salmon they catch. As in previous years, anglers must release chum salmon through Oct. 15. Another change this year is that recreational fishing will be closed from the Highway 106 Bridge upstream to the Highway 101 Bridge on six Mondays to avoid potential gear conflicts with treaty tribal fishers. Those closures are scheduled for Aug. 2, 9, 16, 23, 30 and Sept. 13. Recreational fishing downstream of the Highway 106 Bridge will remain open seven days a week through the fishing season. Anglers fishing the Skokomish River also will be required to release any salmon not hooked inside the mouth and retain the first two legal salmon they catch. In addition, single-point barbless hooks are required and a night closure and anti-snagging rule will be in effect. For Columbia River anglers, this month provides a great opportunity for a triple play. Fishing seasons for fall chinook salmon and hatchery coho open Aug. 1, while summer steelhead are expected to continue providing good fishing well into September. While the fall chinook season opens upriver to Priest Rapids Dam, most of this month’s action takes place in the popular Buoy 10 fishery on the lower 16 miles of the river. A big run of 664,900 fall chinook is expected this year, setting the stage for some good fishing, said Joe Hymer, a fish biologist for the Washington Department of Fish and Wildlife (WDFW). So will the catch. Fishery managers estimate that anglers will catch 12,500 chinook salmon by Aug. 31, when the retention fishery for chinook closes in the Buoy 10 area. They also anticipate a catch of 12,000 coho in that area and another 17,000 chinook between Rocky Point and Bonneville Dam by the time those seasons come to a close. Bank anglers planning to fish at Buoy 10 should be aware that access to much of the North Jetty will be closed, due to a major project being conducted by the U.S. Army Corps of Engineers to reinforce beaches eroded by winter storms. “The North jetty provides the only real bank access to that fishery, so things could get a little crowded,” Hymer said. For the Buoy 10 fishery, the daily limit is two salmon, two hatchery steelhead , or one of each. However, anglers may retain only one chinook salmon (minimum size, 24 inches) per day as part of their daily limit. Only those steelhead and coho marked with a missing adipose fin and a healed scar may be retained. This requirement does not, however, apply to fall chinook, which may be retained whether marked or unmarked. 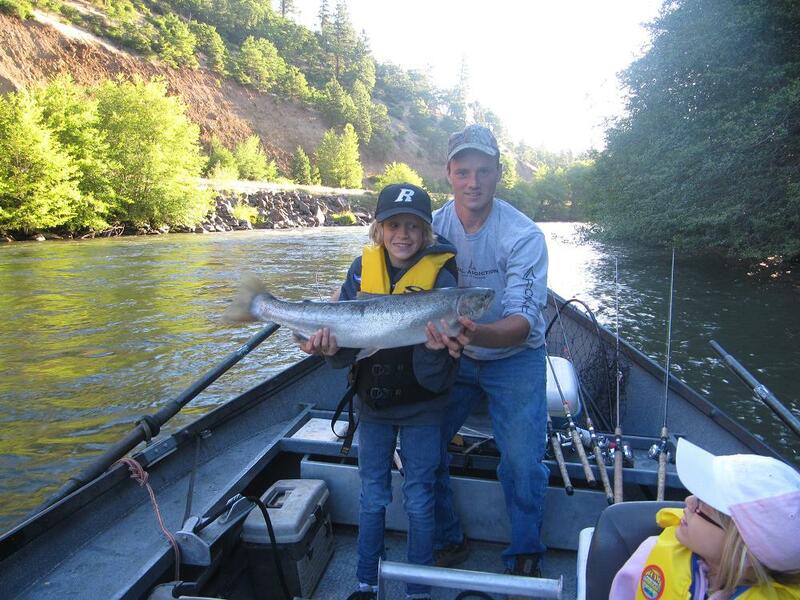 For more rules on the Buoy 10 area and other waters upriver, see WDFW’s Fishing in Washington pamphlet, which is posted online at http://wdfw.wa.gov/fishing/regulations/ . By mid-to-late August, the bulk of the chinook run historically begins to move upstream while increasing numbers of coho move into the Columbia River behind them. For anglers following the chinook upriver, Hymer recommends fishing deep, between 40 and 50 feet down. For a lure, he suggests a wobbler anchored with a heavy weight. While 2010 is not expected to be a banner year for hatchery coho, those fish will help to round out anglers’ daily limits at Buoy 10, Hymer said. WDFW currently expects about 290,000 coho to return this year, down significantly from last year’s exceptionally large run of three-quarters of a million fish. Meanwhile, plenty of hatchery steelhead are still available for harvest, Hymer said. In June, anglers caught more early-run summer steelhead than at any time since the 1970s, and those fish should keep biting hooks through mid-August. By then, the larger “B-run” steelhead – many weighing in the teens – should start arriving to pick up the slack. This year’s return of “B-run” steelhead, most headed for hatcheries on the Clearwater and Salmon rivers, is expected to total about 100,000 fish, about double the size of last year’s run. “The combination of three species – fall chinook, coho and steelhead – makes August a great time to fish the Columbia River,” Hymer said. They’ll also liven up fishing in the tributaries, where anglers have been reeling in respectable numbers of hatchery steelhead for the past few months. As on the mainstem Columbia, the fall salmon season starts Aug. 1 on a number of area tributaries, although salmon fishing doesn’t really take off until September. Meanwhile, Drano Lake and the White Salmon River are good places to try for steelhead looking for cooler waters. Like last year, anglers will again be able to retain up to six hatchery adult coho on all tributaries to the lower Columbia River with hatchery programs. Those rivers include the Cowlitz, Deep, Elochoman, Grays (including West Fork), Kalama, Klickitat, Lewis (including North Fork), Toutle (including Green and North Fork) and Washougal. Also like last year, hatchery fall chinook are the only kind of salmon anglers can retain on the Grays, Elochoman and Kalama rivers. Some new rules will also be in effect, including a requirement that anglers release all unmarked chinook (adults and jacks) on the Cowlitz, Toutle, Green, Washougal, Wind and White Salmon rivers, plus Drano Lake. Last year, that requirement applied only to jack salmon on those rivers. As always, WDFW strongly advises anglers to check the Fishing in Washington rules pamphlet for new rules applicable to specific waters before leaving home. Of course, salmon and steelhead aren’t the only fish available for harvest in August. Walleye fishing has been good in the Columbia River near Camas, as well as in The Dalles and John Day Pools. Bass fishing has also been heating up from Bonneville Dam to McNary Dam. For trout , the high wilderness lakes around Mount Adams and Mount St. Helens offer unparalleled fishing experiences for those willing to brave the mosquitoes. Riffe Lake in Lewis County is still giving up some nice landlocked coho, while Mayfield Lake, Skate Creek and the Tilton River are still receiving regular plants of rainbows. Hatchery sea-run cutthroats should also provide some opportunity on the lower Cowlitz beginning in late August. With water temperatures rising, the month of August is usually best for warmwater-species fishing throughout the region. Chris Donley, Washington Department of Fish and Wildlife (WDFW) district fish biologist, said mixed-species waters are a good bet. Yellow perch, largemouth and smallmouth bass , and crappie can usually be caught at Coffeepot Lake in Lincoln County, Downs and Chapman lakes in southwest Spokane County, Newman and Liberty lakes in eastern Spokane County, Eloika Lake in north Spokane County, and the Spokane River reservoir of Long Lake and Deer and Waitts lakes in Stevens County. Fishing at rainbow and cutthroat trout lakes near Spokane – like Amber, Badger, Clear, Fish, Williams, and West Medical lakes – is best early in the morning or at night, Donley says. The lower Spokane River has nice rainbows and browns, but river anglers need to be aware of catch limits, gear restrictions, and other rules listed in the fishing pamphlet. Sturgeon fishers are reminded of the minimum 43-inch and maximum 54-inch tail fork length and the daily catch limit of one sturgeon. The Snake and its tributaries upstream of Lower Granite Dam are catch-and-release only for sturgeon. The section of the Snake just east of the Tri-Cities, from the mouth to Ice Harbor Dam, is also catch-and-release for sturgeon starting Aug. 1. Fishing has slowed considerably for rainbow trout in the small man-made lakes off the Tucannon River on WDFW’s Wooten Wildlife Area in Columbia County, said area manager Kari Dingman. With or without good fishing, lots of folks like to escape city heat with a weekend camping trip to the area. Dingman said hot and dry conditions, along with a recent wildfire, have resulted in a ban on campfires. Dingman also reminds fishers and other recreationists that a U.S. Forest Service road, bridge and culvert over the Little Tucannon River are under re-construction for the first half of August, so state campgrounds Panjab North and South, along with the Sheep Creek and Meadow Creek trailheads, will be inaccessible during the project. In the north end of the region, kokanee and walleye fishing continues to be good at Lake Roosevelt, the Columbia River reservoir off Grand Coulee Dam. Kokanee fishing is also productive at Stevens County’s Loon Lake during night time hours. Some of the high elevation lakes on U.S. Forest Service property in the northeast district that are stocked with rainbow and cutthroat trout may be good destinations for camping and fishing weekends. In Ferry County, try Davis, Ellen, Empire, Swan and Trout lakes. In Stevens County, try Gillette, Heritage, Sherry, Summit, and Thomas lakes. In Pend Oreille County, try Carl’s, Cook’s, Frater, Halfmoon, Leo, Mystic, Nile, No-Name, Petit, South and North Skookums, and Yokum lakes. More information on these mostly small fishing lakes can be found in WDFW’s 2010 Fishing Prospects at http://wdfw.wa.gov/fish/prospects/ . Washington Department of Fish and Wildlife (WDFW) district fish biologist Bob Jateff of Twisp reports that salmon fishing in the mainstem Columbia River is picking up with the approach of August. Jateff reminds anglers the daily catch limit is six salmon, of which no more than three can be chinook, and only one chinook can be a wild, unmarked fish. The action should also pick up on the Methow River and its tributaries, now that stream flows are finally dropping to fishable levels, he said, noting that those waters are catch-and-release only and that selective gear is required. He advises anglers to check the sportfishing rules pamphlet to be sure which areas are open to fishing. Jateff says lake fishing throughout the Okanogan district generally slows down during the hotter months, except for waters at high elevation. Jateff noted that anglers who fish deep during the cooler parts of the day – very early or late – can catch some nice rainbow trout in the lower elevation waters, too. “Wannacut Lake near Oroville, for example, is a deep lake that seems to hold up well over the summer,” he said. Anglers can find specific information about fishing waters throughout the region, county by county, in WDFW’s Fishing Prospects report at http://wdfw.wa.gov/fish/prospects/ . Wherever of where they go, anglers are reminded to be careful with anything that could start wildfires in the region’s hot and dry conditions. Outing plans should include a check on campfire restrictions on public lands. See Washington Department of Natural Resources (DNR) fire information by county at http://fortress.wa.gov/dnr/firedanger/BurnRisk.aspx . See current wildfire conditions in Washington from the National Interagency Fire Center at http://www.inciweb.org/state/49/ . Fishing for kokanee at Rimrock Reservoir – the 2500-plus-acre impoundment on the Tieton River along Hwy. 12 about 10 miles east of White Pass in western Yakima County – is about as good as it gets these days. That’s the word from both Washington Department of Fish and Wildlife (WDFW) district fish biologist Eric Anderson and WDFW regional habitat program manager Perry Harvester, both of Yakima. Anderson reports the kokanee, or “silver trout,” which are actually land-locked sockeye salmon, run about nine to 10½ inches long. Rimrock anglers are hitting them hard these days. Anderson also recommends kokanee fishing at other Yakima Basin reservoirs including Bumping, and Keechelus and Kachess in Kittitas County. Water levels in streams in the upper Yakima and Naches river systems are in pretty good condition for wild rainbow and cutthroat trout fishing, Anderson said. Anglers should check the stream regulations for details and release all salmon , bull trout , and steelhead . Specific information on stocking Yakima and Kittitas county alpine lakes can be found at http://wdfw.wa.gov/fish/plants/regions/reg3/r3_highlakes.htm . Rather catch walleye ? Creel reports show that interest in walleye fishing is picking up on Lake Umatilla, the Columbia River reservoir behind McNary Dam on the Washington-Oregon border. Creel checkers were actually looking for salmon and steelhead anglers, but 102 anglers out of 129 interviewed were fishing for walleye. There is no minimum size on Columbia River walleye, but only five fish of the 10-fish daily limit can be over 18 inches and only one over 24 inches can be retained. Anglers targeting walleye also caught smallmouth bass , Hoffarth reported. Four bass anglers interviewed averaged about one fish per hour of fishing. There is no minimum size on bass, but only three fish of the five-fish daily limit can exceed 15 inches. Sturgeon fishing is catch-and-release only Aug. 1 throughout the Columbia River. The section that has been closed to all sturgeon fishing, from the Interstate 82 bridge upstream to McNary Dam, opens for catch-and-release only Aug. 1. Hoffarth’s most recent sturgeon fishing checks showed anglers averaging one sturgeon for over six hours of fishing. Most were less than the 43-inch minimum, with a few in the slot limit of 43 to 54 inches, and a few over the 54 inch maximum. This entry was posted on July 28, 2010 at 11:27 pm and is filed under HEADLINES. You can follow any responses to this entry through the RSS 2.0 feed. You can leave a response, or trackback from your own site.